Are you backing Portugal to make a winning start to the Confederations Cup 2017? Read here how to get 7/1 Portugal to win vs Mexico when you join Paddy Power (was 21/20)! Max bet €/£10, paid in free bets! Portugal were extremely solid when they triumphed at last summer's European Championships in France and are one of the antepost favorite team to win the Confederations Cup. Fancy Cristiano Ronaldo & co. to win their opening match in Russia? 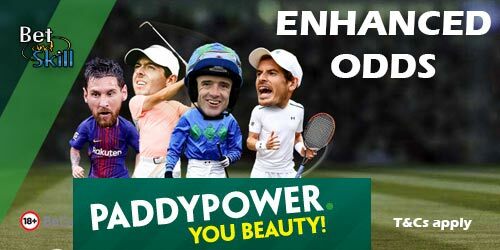 Find here how to claim 7/1 Portugal to beat Mexico at Paddy Power! 3. If Portugal win the match you will be paid out straight away at the normal price and you'll be topped up with the additional amount in free bets within 48 hours. Open a new account. Valid for new customers only. Duplicate accounts are not eligible for this promotion. Deposit £10 or more. Customers using Moneybookers or Neteller to deposit will not qualify for this offer. Place your FIRST BET on Portugal to beat Mexico at the enhanced price through Power Play Plus price on site. The maximum stake for this offer is £10. In-running bets do not qualify for the enhanced prices. Applies to singles only, any bets with any selection in a multiple will be settled at the normal price. You will not qualify for the price enhancement if the Cash Out option is used. If your selection wins, you will be paid in cash based on the normal price on site and will have the extra amount, bringing the bet up to the cumulative 7/1 payout, credited in free bets added to your account straight away. Free bets get credited in increments of £10 and expire after 30 days. This promotion is live until 16:00 on Sunday June 18th and any bets taken after this time do not qualify. Offer applies to customers based in the UK & Ireland. Back 20/1 Mayweather to win vs McGregor at Paddy Power! "Back 7/1 Portugal to beat Mexico at PaddyPower (Confederations Cup price boost)"